We want to help workers injured on the job get the benefits they deserve. The following tips can help make your filing for workers' compensation benefits more likely to succeed. If you have any questions at all, if you wish to seek an independent medical exam, or if your benefits are terminated, call our office at 1-800-898-HAYS. 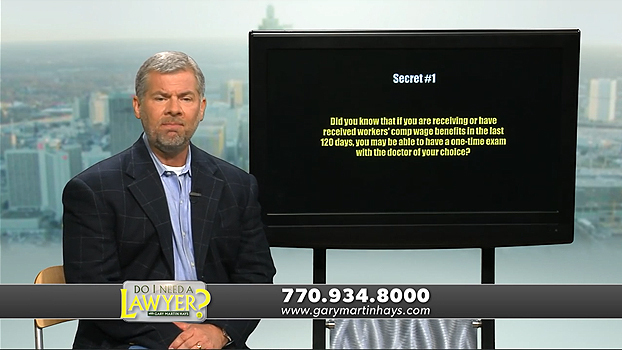 In this segment of Do I Need a Lawyer, Gary Martin Hays discusses some key workers' compensation secrets that adjusters don't want employees to know. Promptly report your accident / injury to your employer (within 30 days). Contact an attorney experienced in workers' compensation claims who can help identify and resolve any problems with your claim. Have the amount of compensation you receive reviewed by an experienced attorney who knows how to work with insurance companies to get you the full amount you are owed. An experienced attorney can negotiate with the workers' compensation insurance company to get you a fair settlement. At Gary Martin Hays & Associates, we understand how to fight insurance companies that try to take advantage of workplace injury victims. If you have questions, we're ready to answer them, and we're fully ready to take aggressive action on your behalf. Remember, you don't pay us unless you win. Call 1-800-898-HAYS today. Many injured workers filing a workers' compensation claim are not aware that they may have the right to a one-time, independent medical exam that does not involve a physician from the employer's panel. Just as with filing for wage benefits or disability benefits, it is important to file your request for an independent medical exam properly so that it cannot be denied by the insurance company. Our experienced workers' compensation team knows how to determine the correct type of physician to perform the exam, based on their expertise and your medical condition. The doctors we use are advocates of injury victims with credentials in a variety of specialties. Their qualifications as independent experts exceed the standards called for by law. The law entitles you to receive workers' compensation benefits as long as you are physically unable to return to work and are declared disabled by your authorized treating physician. Even so, many workers face having their benefits suddenly terminated despite not being able to fully return to work after an accident or injury. The workers' compensation insurance companies will try to do everything in their power to get away with paying the absolute minimum amount of benefits. Their profit motive is no reason you and your family should be denied benefits to which you are legally entitled! Our experienced disability benefits attorneys can help you build the strongest possible case for receiving all of your benefits. Call us today.